"Yes, this is my first time suing a sitting president," Zahra Billoo said. 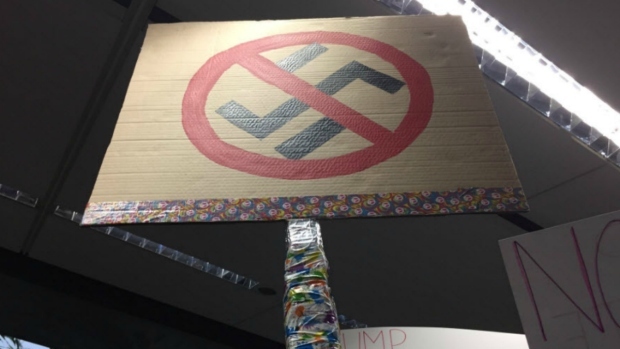 In this Saturday, Jan. 28, 2017 file photo, a protester holds a sign at San Francisco International Airport during a demonstration to denounce President Donald Trump's executive order that bars citizens. A civil rights lawyer in Santa Clara is one of 15 plaintiffs and 12 other "Jane and John Does" to sue Donald Trump and some of the government's top leadership over what they say is an unfair "Muslim Exclusion Order." 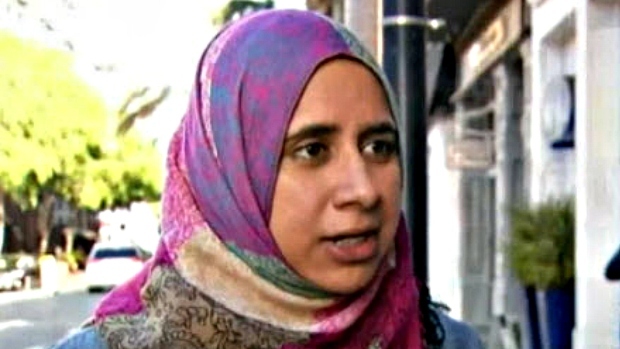 Zahra Billoo is the executive director of the Council on American-Islamic Relations, San Francisco Bay Area, who along with the others is asking for injunctive and declaratory relief in a 57-page lawsuit. "Yes, this is my first time suing a sitting president," Billoo told NBC Bay Area. Is she scared? "All the plaintiffs are putting their safety on the line in order to advocate for American values," she said. 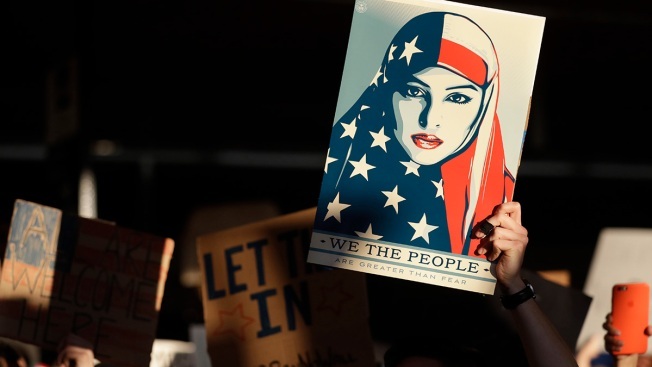 "I am cautious, but I am also so incensed that Trump and his advisers would have the audacity to attempt a Muslim ban." Billoo said that during the Women's March on Jan. 21, she encouraged people to choose a "lifestyle of resistance, and I'm taking that advice myself." The suit against Trump, Homeland Security Secretary John Kelly, the U.S. Department of State and the director of National Intelligence was filed Monday in the United States District Court of the Eastern District of Virginia. Other notable plaintiffs include Linda Sarsour, a Palestinian activist and executive director of the Arab American Association of New York, who was also an organizer of the Women's March and Rashida Tlaib, the first elected Muslim woman to serve in the Michigan Legislature who is a lawyer at the Sugar Law Center for Economic and Social Justice. The unnamed plaintiffs represent people who are lawfully living in the United States and prevented from traveling and and from the country because of their immigrant status. Zahra Billoo, executive director of CAIR, San Francisco Bay Area. The ban, he said, was similar to action taken by President Barack Obama in 2011 when visas for Iraqi refugees — even those who risked their lives to help the American war effort — were all but halted. But the plaintiffs, who are part of a national CAIR lawsuit challenging Trump's executive order that bans travel directed at seven Muslim-majority nations, allege the order gives Islam the "stigma of government disfavor." They also allege the order violates the Establishment Clause to the First Amendment because they are being discrimination against for their religion. The suit characterizes the ban as a first step in fulfilling Trump's campaign promise to impose "a total and complete shutdown of Muslims entering the United States" until the government "can figure out what is going on." The plaintiffs call the order full of "vulgar animosity" and refer to it as the "Muslim Exclusion Order." The plaintiffs refer to Trump's "hateful, year‐long campaign which was fueled, in significant part, by a desire to stigmatize Islam and Muslims." And "Trump's bigoted views on Islam," the plaintiffs say, is the "legal manifestation of those bigoted views," the suit alleges. Since the signing of the travel ban on Friday, the suit says that five district courts around the country have issued stays.